No Christmas will be complete without Tom Cruise under the tree. And you can make that happen this year with a copy of Mission: Impossible - Fallout, which is coming to 4K Ultra HD, Blu-ray and DVD just in time for the Holidays. This action packed sequel will be released on Digital November 20th and on 4K Ultra HD, Blu-ray and DVD December 4th. The critically acclaimed smash hit, which stars Tom Cruise, will include over an hour of BTS content delving into the incredible stunts, intense action and exotic locales featured in the film, deleted scenes, multiple commentaries including commentary by director Christopher McQuarrie and Tom Cruise and more. "The action is off-the-charts spectacular" (Peter Travers, Rolling Stone) in the "wildly entertaining" (Chris Nashawaty, Entertainment Weekly) global hit Mission: Impossible - Fallout. This exhilarating, action-packed sequel will also be available as part of the Mission: Impossible 6-movie Blu-ray and 4K Ultra HD + Blu-ray Collection, the perfect gift for the holidays. Produced by Tom Cruise and Bad Robot, Paramount Pictures and Skydance present Mission: Impossible - Fallout, one of the best reviewed movies of the year, thrilling critics and audiences alike and boasting a 97% Fresh rating on Rotten Tomatoes. Now fans can go deeper into the Mission with over an hour of high-octane, behind-the-scenes footage highlighting the incredible stunts, heart-pounding action and exotic locations on Digital, a 3-disc 4K Ultra HD Combo Pack or a 3-disc Blu-ray Combo Pack. 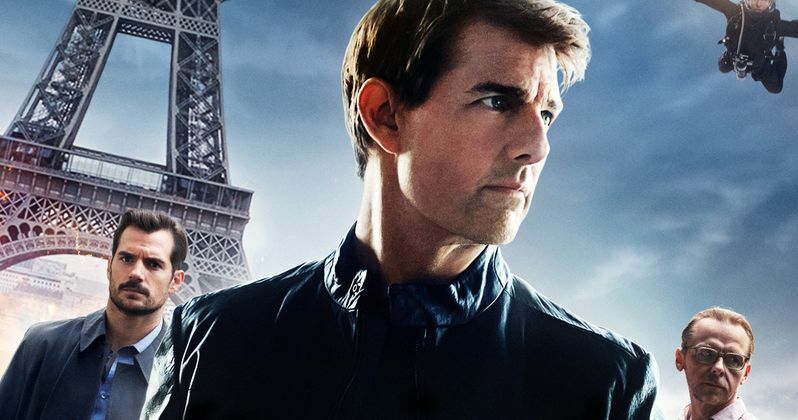 Drop from the sky, race through Paris, and cling to a cliff with Ethan Hunt as the cast and crew reveal the incredible work that went into creating the breathtaking action. Plus, check out deleted scenes, storyboards, multiple commentaries, and much more. The 4K Ultra HD disc and 4K Ultra HD Digital release feature Dolby Vision™, which brings entertainment to life through ultra-vivid picture quality with spectacular colors, highlights that are up to 40 times brighter, and blacks that are 10 times darker. The film also boasts a Dolby Atmos soundtrack remixed specifically for the home to place and move audio anywhere in the room, including overhead. In addition, both the 4K Ultra HD and Blu-ray Combo Packs include access to a Digital copy of the film. On a dangerous assignment to recover stolen plutonium, Ethan Hunt (Tom Cruise) chooses to save his friends over the mission, allowing it to fall into the hands of a deadly network of highly skilled operatives intent on destroying civilization. Now, with the world at risk, Ethan and his IMF team (Simon Pegg, Ving Rhames, Rebecca Ferguson) are forced to work with a hard-hitting CIA agent (Henry Cavill) as they race against time to stop the nuclear threat. Written and directed by Christopher McQuarrie, Mission: Impossible - Fallout also stars Sean Harris, Angela Bassett, Michelle Monaghan and Alec Baldwin. The Mission: Impossible - Fallout DVD includes the feature film in standard definition. You can cover a lot of bases with this one when it comes time to hand out gifts during the Holidays. There's something for Tom Cruise fans, comedy fans, action fans, drama fans, and fans of big blockbuster tentpole action movies. You can check out the cover art direct from Paramount Home Video.